Whilst the London we love sweeps up the mess of the riots and works to maintain last night’s calm, we in Tower Hamlets are afraid that we still have worse to come. The violence that could break the peace of our streets and estates on the 3rd September is avoidable – the Home Secretary has to ban the march that the English Defence League are planning to have through Tower Hamlets. Our rich history of anti-racism is a wonderful inspiration to draw on; its converse is that racists and fascists are drawn to it too. In the early nineties a BNP councillor was elected on the Isle of Dogs. A mass community movement defeated him in the 1994 local elections. The 1970s and 1980s saw racist attacks, some of which resulted in death– Altab Ali Park in Whitechapel is named after a young Bengali man who was killed there in a racist murder. It is the spirit of Cable Street that lives on. On 4th October 1936, Oswald Mosely and his fascist Blackshirts wanted to march through the East End of London, a clear attempt to dominate the streets and intimidate a then largely Jewish community. A coalition of local people, dockers, The Labour Party, Communists, trade unionists and others united to stop them, on Cable Street. 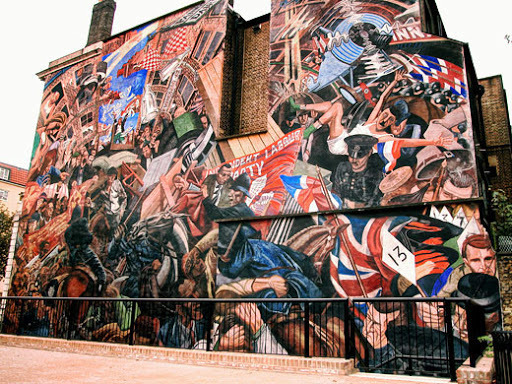 The mural that is there and commemorates it includes the popular slogan from the time, inspired by the Spanish Civil War: They Shall Not Pass – No Pasaran! Over the past few nights groups of people in Tower Hamlets have sent a similar message to those seeking to cause trouble here. Most visibly outside the East London Mosque, a group of worshippers stood together peacefully and stopped damage to people and buildings. It happened elsewhere too. I spoke to shopkeepers standing in their doorways as I walked around – not looking for trouble, not accepting it either. We want peace on our streets. It is very important to us that a group of racist, fascist, Islamophobic thugs shall not be allowed to pass through our community. We hope that they can be stopped through the rule of law and the Home Secretary. The people of Tower Hamlets must never again be put in a situation where we have to confront violence and hatred head on. We’re a vibrant democracy in Tower Hamlets. Karl Marx spent some time here whilst writing his violent revolutionary theories. We elected a Communist MP and councillors in the last century. Sometimes we debate amongst ourselves about how to respond to groups like Hizb ut-Tahrir who organise in tiny numbers on our streets. We have conversations about the limits of what is acceptable in a democracy, what is freedom of speech and what is hatred and incitement all the time – debates that are more subtle and complex than you would think from some of our national media coverage. However, there is no difference of opinion amongst elected politicians here about how to respond to the EDL. Our Full Council meeting, including Independents, one Lib Dem, two Respect and a group of Tories as well as the majority Labour Group voted unanimously to support a motion calling for the march on the 3rd September to be banned. The Labour Group, Rushanara Ali MP, Jim Fitzpatrick MP and John Biggs AM have all written to Theresa May calling on her to ban the march. We know the devastation an EDL march could cause here. The police in Tower Hamlets have done a great job recently, but the events of the last few days make it crystal clear that it is too much to ask them to guarantee our safety if the EDL are allowed to march, on the day of the march or in the days after. The EDL aren’t coming to exercise their democratic right to freedom of speech, they are coming to engender hated, especially against Muslims. Please sign the Hope and Hate petition that asks Theresa May to ban the march. Very nice article. The EDL only spread hatred and violence.